flooring is common in more vintage homes built in the early 20th century. In Los Angeles and Orange County, many homes have some type of flooring or staircase. Fiberglass is also a popular material for indoor and outdoor stairs due to its durability and weather resistant properties. Capital Deck & Stair is one of the largest installers of flooring. We specialize in repair and installation for homes and businesses. 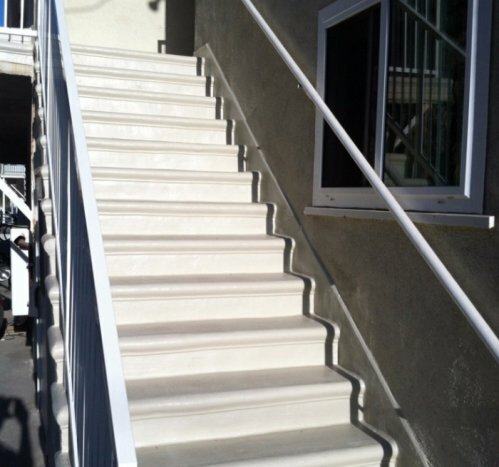 Our professionals can also perform fiberglass staircase installation and repairs. We take pride in our craft and always deliver the highest quality work along with friendly and courteous service. With over 30 years of industry experience, we have built a strong customer base that trusts us when they need dependable installations and repairs. Why work with Capital Deck & Stair? Fiberglass and staircases can both offer exceptional performance, durability, as well as aesthetics. One of our professionals in Los Angeles can come to your door for a free estimate and explain your options. We can explain your choices and provide recommendations on what type of material would be suitable for your property. Our friendly team can also answer your questions and give tips on how to maintain your new staircase. Whether you need a simple stair repair project, or would like to waterproof your entire deck, Capital Deck & Stair can provide quality craftsmanship done right the first time. Call us now to learn more about our services!